Wearing matching T-shirts and wide-brimmed straw hats, three members of the Pritchett family stood on stage at the 25th annual Casa Pacifica Angels Wine, Food & Brew Festival, looking a little stunned. Their submission to the festival’s Yummie Top Chef culinary competition had just been named the first-place finisher in the “sweet” category, making it the first vegan dish to snag an award in the nearly decade-long history of the contest. “We are just so happy you guys all liked it,” said Sarah Pritchett, who with husband Shawn Pritchett and his sister, Amanda Pritchett, entered the dish under the banner of their business, Ragamuffin Coffee Roasters. The winning dessert featured cold-brew coffee that Sarah and Shawn — who own Ragamuffin sites in Newbury Park and inside The Annex at The Collection at RiverPark in Oxnard — had just started offering on nitro tap the week before. They added vegan vanilla bean ice cream made by Nada Moo and topped things off with a vegan chocolate brownie cookie made by Amanda, the coffeehouse’s lead baker. “We have a lot of vegans and we have a lot chocolate lovers; this cookie came from wanting to create something for all of them,” said Amanda, grinning as she held the trophy sauté pan. 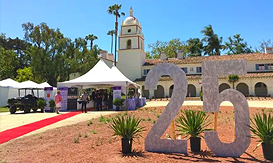 Also making festival history was Alex Castillo, executive chef at Twenty88 in Camarillo, who took first-place honors in the competition’s “savory” category for the third year in a row. Castillo celebrated by holding up three fingers for photographers the minute he stepped off the stage. Alex Castillo, executive chef at Twenty88 in Camarillo, holds up three fingers to represent his third back-to-back, first-place win June 3 in the “savory” category of the Yummie Top Chef culinary competition presented during the Casa Pacifica Angels Wine, Food & Brew Festival. “The key is to think about the details, to use a unique fusion of ingredients,” Castillo said when asked for the secret behind his winning streak. Making a list: Five foodie things to do this weekend (June 8-10). More than 25 entries were submitted in the blind-tasting competition, which included a pair of cooking-show stars as judges: “MasterChef” season-seven winner Shaun O’Neale and season-six competitor Olivia Crouppen met for the first time before getting down to the business of eating. (O’Neale also signed copies of his cookbook, “My Modern American Table: Recipes for Inspired Home Cooks,” after the scores had been tallied.) Also judging were Eric Kopelow, corporate executive chef for NBC Universal Studios Hollywood; former Yummie winner Nic Manocchio, now chef de cuisine for University Auxiliary Services at CSUCI, and yours truly. Ragamuffin Coffee Roasters’ entry in the Yummie Top Chef culinary competition arrives at judges’ table with a vegan chocolate cookie brownie resting on top. Made with cold-brew coffee and vegan vanilla ice cream, the dish took first place in the “sweet” category. The hotly contested contest also saw two awards going to Barrelhouse 101 of Ventura. The culinary team led by kitchen manager Becky Blosser took second in the “savory” category for Puerco’s Nachos, featuring slow-cooked carnitas on freshly popped chicharrones, and third in the “sweet” contest for a dessert version that topped cinnamon sugar-dusted chicharrones with lime creme and raspberry-chili coulis. Both are variations on previous Barrelhouse 101 menu items and will likely reappear in the near future, said owner Joby Yobe. Second place “sweet” went to pastry chef Julia San Bartolome, a former Yummie winner who returned to the competition after serving as a judge in 2017. Now the co-owner of frequent “Cupcake Wars” victor Sweet Arleen’s in the Westlake Plaza shopping center, San Bartolome announced her presence with an interactive dessert that was equal parts playful and serious — and that contained deconstructed elements of the cocktail that inspired its name. Dubbed an “Old Fashioned Dessert,” the dish presented judges with an orange-scented buttermilk pound cake with bourbon pastry cream and a crispy sugar crust, an amarena cherry soaked in white balsamic, and a pastry bag for applying as much, or as little, maple whipped cream as desired. Rhumb Line Restaurant of Ventura took third place in the “savory” category for its toasted square of focaccia topped with house-cured salmon, wasabi cream and guava jam. The just-a-bite (or two) morsel is a sign of things to come, said executive chef Ricardo T. Carreto. “It will be on the menu soon as an appetizer. It’s a nice, delicate dish to start the meal,” he said. Also thinking about the future is Castillo, who said he is already feeling the self-imposed pressure to turn his three-peat into a four-peat. “When I entered this year, I thought, even if I don’t place, it’s for a good cause,” Castillo said of the festival, which netted about $575,000 for programs at Casa Pacifica Centers for Children & Families. Jalisco-style short ribs with sauteed kale and brussels sprouts arrive for blind judging during the Yummie Top Chef culinary competition at the 25th annual Casa Pacifica Angels Wine, Food & Brew Festival June 3 in Camarillo. The dish by Alex Castillo, executive chef at Twenty88 in Camarillo, went on to take first place in the “savory” category. “I’m thinking about doing sweets, just to mix it up and take some of the pressure off from winning in savory again,” Castillo said with a laugh. “I think I already have something in mind.” The 26th annual festival is scheduled for June 2, 2019. Mark your calendars — and keep your eyes!www.cpwineandfoodfestival.com.